Friday 31st October – Tenon Koshu (5 years) – This traditional sake has been aged for five years resulting in a mature, full-bodied flavour. Saturday 1st November – Iichiko Barley – This shochu is distilled from barley rather than rice giving it a mild taste which is really easy to drink. Sunday 2nd November – Chikurin Junmai – This junmai sake is made from rice, water and koji mold which produces a full, clean and dry flavour. But don’t worry if you can’t make those dates! 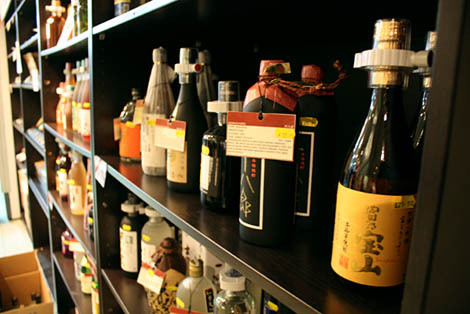 Drop by the Tea and Sake Shop anytime in the basement of the Japan Centre Piccadilly store (below the restaurant) for your free samples of sake and shochu. The friendly and knowledgeable staff are always on hand to answer any questions you may have! The Tea and Sake Shop is open Mon-Sat 10:00 – 19:00 and Sun 11:00 – 19:00. Posted in Tea and tagged Sake. Bookmark the permalink. Inside JC – We Expanded!